It's Blog-A-Pal-Loosa day 6 and that means it is my giveaway day!! I have never done a giveaway before and I am so excited to be taking part in this group giveaway. It's been brilliant fun! Find more Blog-A-Pal-Loosa giveaways here. 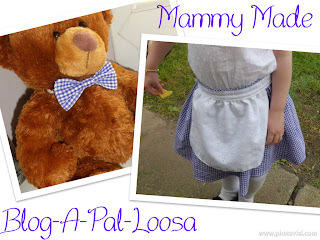 Today I am going to be giving away EITHER a purple gingham bow tie OR an apron skirt made in the same purple gingham and flowery broderie anglaise. They both turned out so cute and I am excited to be able to make one for the little boy or girl in your life. I know you will love them too! Both are toddler size but can be made bigger or smaller, depending on measurements. Please bear in mind that I live in England. I do not mind posting worldwide but please allow at least 2 weeks for delivery. It's refreshing to find someone in the younger generation who can sew and make things for her kids like you do. That shirt is adorable!! Love the fabric you choose!! I love that shirt! :) thank you! i love your color scheme! so bright and cheery! I really enjoy your blog! I especially like the crafts that you make. This is such a cute giveaway! Cute Blog!!! Very nice to do the blog-a-pal-loosa with you! if i won it would be so hard to choose. skirt for the granddaughter or tie for the grandson. they are both so cute. i'm a new follower. i enjoy just reading your posts. i get a lot of ideas for my granddaughter from things you make up for your two.